Changes in electronics and technology come fast, but finding ways to deal with obsolete items can slow you down. 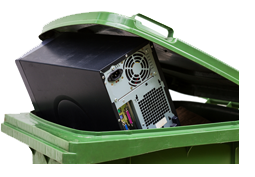 With BoxQ, computer recycling, electronics recycling, phone recycling, and more, are easy. BoxQ also provides secure data destruction, ensuring that your personal or professional information is never compromised. (*) Items require additional fees due to their handling difficulty. (**) Data may be securely destroyed with certificate of destruction for an additional fee. BoxQ does not accept mercury lamps. If you have an item that is not on this list, please contact BpxQ electronics recycling technicians before bringing it in.